I got this a while back and never got a chance to do it! But now I can! Here I go…. UPDATE: After awarding Leanna, she gave it back to me! Thanks, Leanna! If you receive the award, here’s what you do! 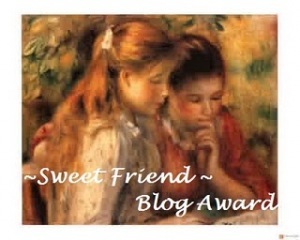 1.Award and Tag at least 5 sweet friends on the internet. 2. Answer the tag (below) in your post. 3.You may tag the person that awarded you. 4. Comment on the post that awarded you!!!! 3. Question: List three of your character qualities: Answer: People say I am kind/sweet, and I am really creative/imaginative. (I try not to brag when I do these!) Um, and I guess people say I am very smart. My friends say that a lot! 4. Question: What is your favorite thing to blog about? Answer: Dolls! it’s what my blog is about. I love to post top-secret information about upcoming items, and I love to make photo stories and posting my doll’s adventures. Hannah (Irishgirl)- She gave me this so she already has one, but here’s another because she is a sweet friend! 🙂 Oh and she’s already done the tag so don’t worry about that! Liz (American Girl Fan)- Happy 2nd anniversary to her anyway! Her website is now 2 years old! Leanna- She does not have a website, but she could do this on picasa!!!!! I also would like to nominate Quinlyn from Quinny and Co but she has been awarded this award and others already and I wanted to pick people who don’t have a lot of awards! Now please do NOT feel bad if you did not get it! I gave it to people who have websites because that makes it easier to pass on. I would also have liked to give it to others, too, but I could only pick 5. I will try to pick different people once I get another award!